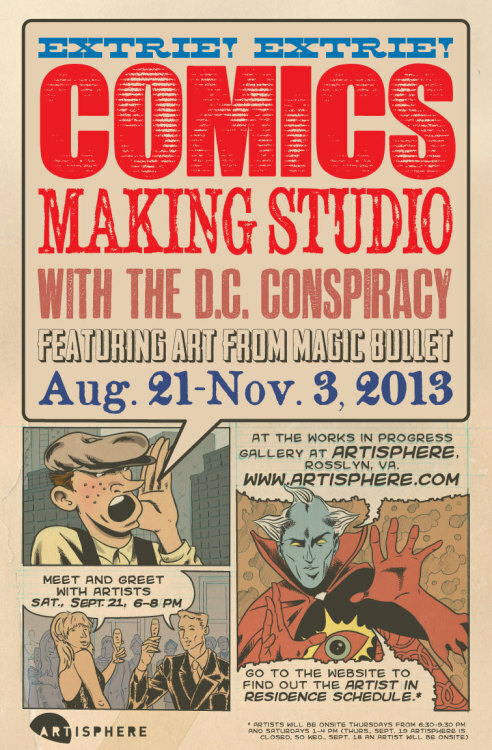 I’m participating in a DC Conspiracy art show and open studio that starts today! Check out awesome comics artists from the DC and Baltimore areas creating art live in the open studio, or just look at some great work from our local free comics newspaper, Magic Bullet, on the wall. The dates when you can find me there to say hello are: Saturday September 21, 6-8pm (artists meet and greet!) or October 11 and 12 (open artists studio!). These events are taking place at Artisphere in Rosslyn, VA, just over the bridge from Georgetown. Hope to see you there!